Growth: United States and Canada. Appearance: Generally straight grained with a coarse texture. Grayish brown heartwood and light brown sapwood. Physical Properties: Moderately heavy and hard with medium strength, stiffness, and shock resistance. Softer, weaker and lighter than white ash. Steam-bends exceptionally well. Working Properties: Works well with hand or machine tools - easier than other ashes. Marginal turning and mortising properties. Pre-drilling recommended. Stains and finishes well. Uses: Used for interior trim, furniture (bent parts especially), basket weaving (splits easily along annual rings), dowels, plywood, and decorative veneer. 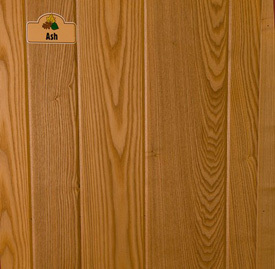 Comments: White ash is a better choice than black ash for applications such as tool handles where strength is important.